Brave Elizabeth is a biography of Elizabeth Jackson, the mother of President Andrew Jackson. I believe that environment and heredity influence a person, and it was fascinating to me to research the mother of one of our Presidents; here is a snippet of her life. 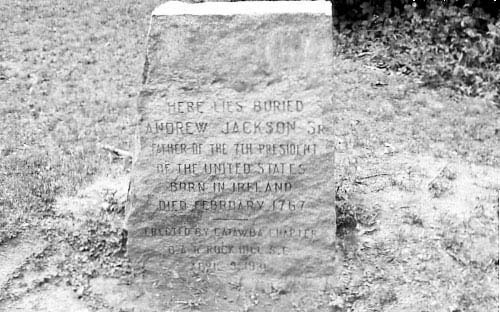 Andrew and Elizabeth Jackson were living in Boneybefore, Ireland, in 1764. They were tenant farmers and not making enough money from their crops and sheep to make ends meet. Taxes continued to go up, and the weather continued to cast blights on their harvests. The Scotch-Irish couple worked hard, but life under the British rule was a hard-scrabbble existence. Disrespect and prejudice for their Presbyterian religion was also challenging. A new life in a new land captured their thoughts. 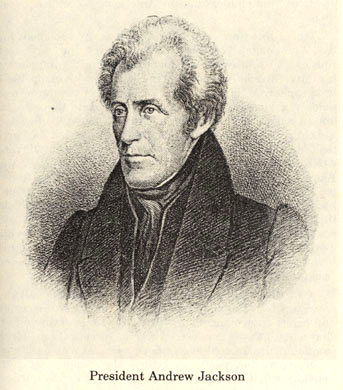 In April, 1765, Andrew and Elizabeth Jackson crossed the Atlantic Ocean to the colonies with their two children. Hugh was two, and Robert only a babe. The eight week voyage from Larne, Ireland, was uneventful. They bought land close to Elizabeth’s family and erected a small one-room cabin. They planted crops and started over. Happily for two years, the Jacksons worked hard and struggled to eke out a living in this red clay, but in March, 1767, an accident occurred. Though small in stature, Elizabeth was strong and resilient in spirit. She adapted to life’s changes and disappointments and put other’s needs before herself. Working hard and pushing forward through challenges was the model she set for her sons. After Andrew’s death, her sister and brother-in-law, Jane and James Crawford, asked Elizabeth to move in with their family. Jane had been sick for several years and needed help with the housekeeping. Their eight children needed more supervision than she could give, so the Jacksons joined the Crawford household. Busy with the daily chores of planning and preparing meals for 14 individuals in a fireplace, tending to the needs of 11 children and her ailing sister, mending, spinning, managing a garden, churning, etc., Elizabeth continued to weave cloth for the community. She earned money from the neighbors by selling it and was known for the quality and expertise of her work. Elizabeth wanted her sons to have a formal education. All three attended the church and community schools, but Hugh and Robert had more aptitude for outdoor activities, and they wanted to farm. Andy learned to read at an early age, and his mother thought he might become a minister. His personality was not for a scholar’s life though, and the Revolutionary War interrupted his education. Elizabeth’s faith in God and His Providence was a major ingredient in her character. She had a small Bible that she carried in her pocket and prayed often. She taught her sons the importance of obedience to the Bible’s teachings and encouraged them in their loyalty to each other and the rest of their family. 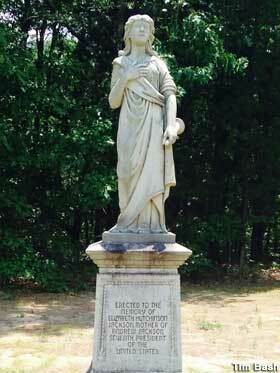 Elizabeth urged deeds and words honoring God, family, and country. 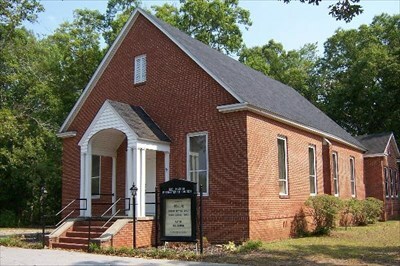 She and her family attended the Waxhaws Presbyterian Church. 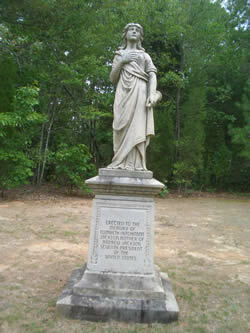 The Waxhaws settlement was connected to Charleston via the Catawba Path, also known as the Camden Salisbury Road, with many travelers. Merchants and Indian traders carried their wares to markets. Farmers drove their cattle to sale. New settlers in the Conestoga wagons or on foot were daily visitors. All of these travelers kept trade, culture, and news flowing into the upcountry where the Jackson family lived. Because of the proximity of the Crawford home, visitors kept them in the know with information and intelligence. On June, 20, 1779, sixteen-year-old Hugh died after the Battle of Stono Ferry near Charlestown. The two hour battle was not a win for the Patriots, but the militia fought bravely. Hugh was not wounded but died of heat exhaustion. Elizabeth nursed the dying and wounded after the Battle of Waxhaws. 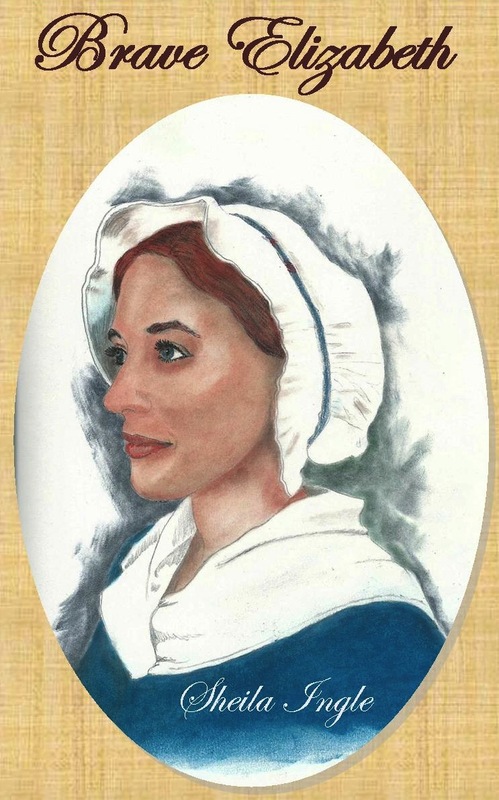 She hid with her family from the British, as they stole and burned the patriots’ farms. Robert and Andy were under the command of the experienced Major William Richardson Davie. Because of his youth, only 13, Andy served as a messenger. Guerrilla warfare and destruction was the aim of both sides, and enemy neighbors paid back old insults. Then in the spring of 1781 both Robert and Andy were captured by the British, along with others in the Waxhaws militia. They were taken to the Camden Jail. Smallpox was in every cell, and before long both boys were afflicted. Elizabeth Jackson was determined to rescue her sons from this hell hole. She audaciously went to see Lord Rawdon and asked for him to add her sons’ names to a prisoner exchange that was in the works. He was not unhappy to release two sick prisoners. Their mother nursed them for several weeks, but Robert was too weak and died. She never left Andy’s side until he could walk by himself. Horrific tales about how the Patriots were being treated on the British prison ships in the harbor of Charlestown began to circulate. Elizabeth found out that several of her nephews were on those ships suffering with cholera. Knowing their chances to survive were small without some kind of nursing, Elizabeth and a couple of women from the Waxhaws community decided they needed to go help the young men. In the fall of 1781, three women left home on a mission of mercy. Elizabeth’s nephews survived, but she did not. She caught cholera and was buried in an unmarked grave in Charleston. Elizabeth taught her sons the (1) difference between right and wrong, freedom and oppression (2) the importance of helping family and friends (2) reverence for truth, justice, and freedom, (3) a deep patriotic devotion to country. 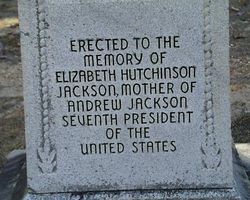 Elizabeth Hutchinson Jackson was a Patriot, a SC Revolutionary War Heroine, and the mother of President Andrew Jackson. Her story is worth remembering. Posted in Uncategorized and tagged Battle of Stono Ferry, Brave Elizabeth, Camden Jail, Elizabeth Hutchinson Jackson, President Andrew Jackson, Revolutionary War heroine, South Carolina heroine, Waxhaws Presbyterian Church, Women's History Month. Bookmark the permalink. 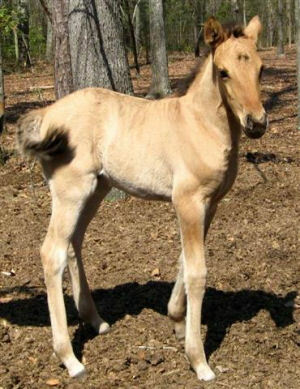 In June 2010, the Marsh Tacky horse, a breed now on the verge of extinction, became the official State Heritage Horse of South Carolina. If you’ve never heard of Marsh Tacky horses, you’re in good company. This horse is a living link to the history of South Carolina. 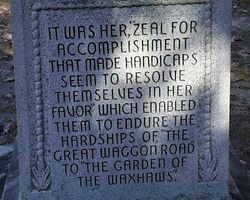 Most people haven’t, but I found out about them when researching Elizabeth Jackson. She and her sons rode Marsh Tackies, just like General Francis Marion and his troops did. Over and over the sure footedness of these horses kept the British from capturing Marion in the Low Country swamps during the Revolutionary War. Listen to David Grant talk about his Marsh Tacky herd. As Mr. Grant said, Marsh Tacky horses are descendants of the horses Spanish explorers left behind on the south Atlantic coast in the 1500s, which bred with the stock Spanish settlers later brought to the New World. They are native to our state. They are beautiful animals. John and I visited a Marsh Tacky farm in the lower part of the state several years ago and watched them enjoying themselves in a field. Marsh Tackies got their name from the fact that they live in marshy areas, and the term tacky, which means common. Feral herds adapted to the conditions of America’s southeastern coastal regions. Sturdy and smaller than many common breeds at only 13 to 15 hands high, Marsh Tackies adapted to swamps and wooded wetlands, surviving on marsh grass and other available forage that couldn’t sustain most breeds. Their distinctive gait provides a greater stability in the terrain, and when stuck in quagmires. 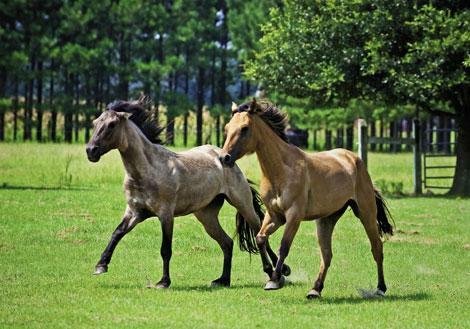 This is called the “Swamp Fox Trot.” They learned to lie down on their sides, pull their feet free, and get up, instead of panicking as most horses would. Marsh Tacky’s habitats originally ranged from Myrtle Beach, South Carolina to St. Simon’s Island, Georgia. They were widely used in the Gullah community for transportation, farming, and hunting until cars and trucks became prevalent. During the Civil War, these horses became popular again. Because the Marsh Tacky was such a quality worker, he was seen in every yard in those days. They delivered the mail, plowed fields, brought people to visit and functioned in every way required of a horse in a community. During WWII the Tacky and his rider roamed the SC seacoast looking for German U-Boats. But by the mid twentieth century they could be found only on outlying islands. Fewer than 300 Marsh Tackies remain today, none in the wild, and efforts are being made to save the breed from extinction. 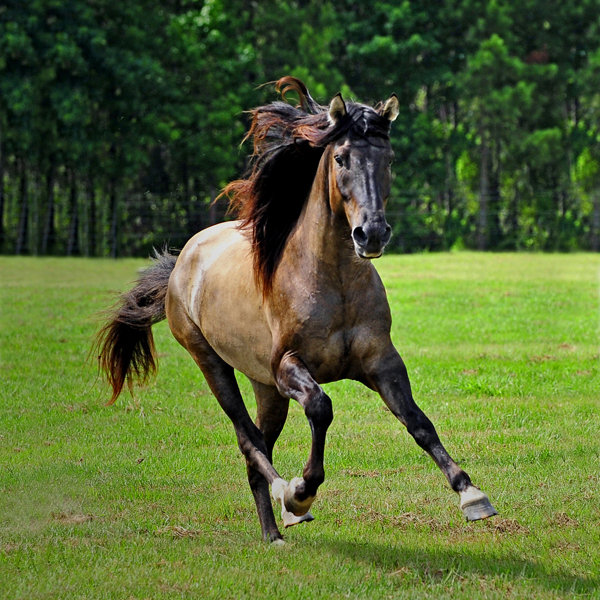 For some beautiful pictures of these horses, visit http://www.carolinamarshtacky.com/. The Carolina Marsh Tacky Association was formed in 2007 to preserve and promote the Marsh Tacky horse; check out their Facebook page for information about their work. We need to pay attention to what we read and hear about these Carolina horses; the Marsh Tacky is ours. Posted in Uncategorized and tagged D. Michael Kingsford, Eliabeth Hutchinsn Jackson, Elizabeth Hutchinson Jackson, General Francis Marion, Marsh Tacky, Revolutionary War, SC, Spanish explorers, State Heritage Horse. Bookmark the permalink.